To cook wild mustard, wash the greens well and cook in salted water. 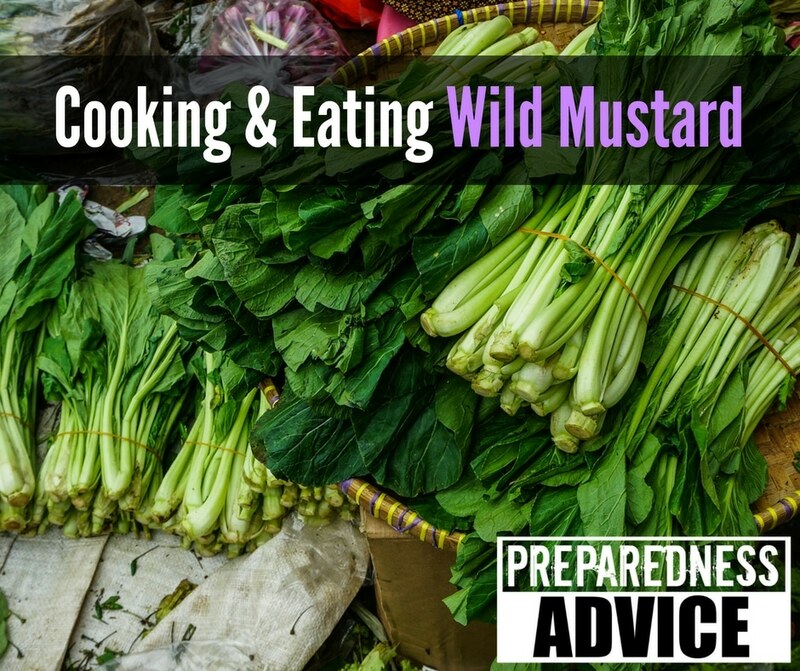 Wild mustard can be somewhat sharp when raw and somewhat bitter when cooked. Blanching it or boiling it in water for a few minutes will remove the bitterness (the longer you boil the less bitter it’ll be). It can be used like spinach in any recipe. The seeds are black and can be used to make mustard. They can also be used in pickling, which would be very handy in a TEOTWAWKI world if other pickling spices weren’t available. Chickens and the rabbits love the dried stalks as a treat in the spring and summer. Wild Mustard grows in most of the U.S. You will see it in the spring to early summer. A good rule in foraging for wild plants is to always find a local expert to learn from, there are lots of poisonous plants out there. The book Idiot’s Guide to Foraging is a good starter book for learning this very important survival skill. After all, it would be a shame to starve to death if you were surrounded by edible plants but didn’t realize it. This entry was posted in edible plants, food storage, survival and tagged foraging, plants, wild mustard, wild plants. Bookmark the permalink. 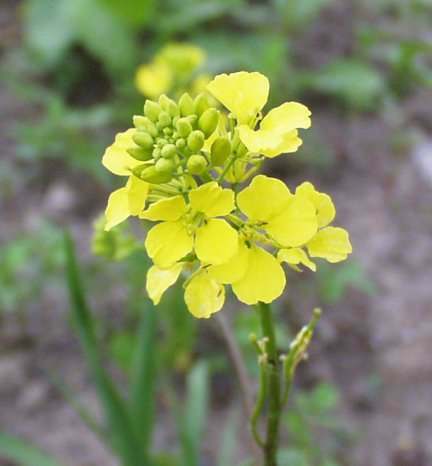 Pickup a copy of John Kallas’ book, “Edible Wild Plants” which goes into this plant, (which appears to be wintercress or field mustard) among other mustard family plants. He also details several other commonly found plants across North America. His book is well-written, full of pictures and explanations on safely identifying, harvesting, and cooking these plants. I’ve begun harvesting this and other plants in my area just this spring. Several things I’ve learned from John’s book as well as through self-experimentation. – For wintercress, I’ve eaten the leaves, flower heads, unripened flower heads, and seed pods. I found the flower heads to be sweet, as the petals are said to give this sweetness. I stir fried them with several other vegetables and enjoyed them. – Remember if you boil them to remove the bitterness, that you’re also removing part of their vitamin and mineral content. John recommends the following in his book: Only use enough water to allow the leaves to float freely, bring the water to a rolling boil, then add the leaves and boil 3-5 minutes. – If in a true survival situation, you would need to make the most out of everything you had, which would mean stewing most everything you gathered or hunted and consuming both the solids and broth. This would ensure maximal caloric and vitamin/mineral intake. I have seen a picture of a vineyard in California showing wild mustard between the rows of grapes ,does the mustard have a commercial value ? Traditionally the are used to improve soil quality and control erosion. The young leaves and flower buds are pretty tasty. unopened raw buds taste like broccoli. as the buds open they get a hotter taste. the ones with a light blue, I was told that they are wild radish, I didn’t like them but the horse did. Really old post, but I’ll hazard a reply if you’re still interested. Keeping vegetation, especially wild varieties, between planting rows has benefits and drawbacks. I’ll start with the downsides. It draws soil nutrients and water resources away from the primary crop. If it blossoms at the sane time as the primary crop then it can distract pollinators. Grapes, as in your vineyard example, are wind pollinated, so there’s little benefit here to the core business in keeping local pollinators healthy; unless they raise other plants, such as fruit trees, mint, lavender, etc… for additional components or products. If it gets diseased there is a chance it is communicable to the primary crop. It can attract foragers and pests that may also attack the primary crop. If it blossoms in off-seasons compared to the primary crop then it can sustain pollinators throughout more of the year and keep local pollinator populations higher. It will have a life-cycle and will feed the primary crop with its “autumn” stage. Most large industrial farming today is based on a system called “monocropping” where only one type of plant is allowed to live in under the designated area. You’ll have miles of uninterrupted single crop fields. This gives maximum resources to the primary crop, even if some need to be imported such as nitrogen and pollination services. youtube – eat the weeds – by green dean. everything the he has posted, that I have grazed on in the past, must be OK. I am still alive and grazing. he has over 150 posts and goes in to detail about how to ID each plant. plant a garden of weeds and most people will pass it by. Hi I want to know how I can grow wild mustard greens in my garden. Also want to know if I can freeze the greens, and if so, how long are they good in the freezer?